Welcome to the PositionDial blog. You have been redirected here because the PositionDial website is currently under reconstruction. When we are back up and running you will be the first to know. We are really excited to have launched brand matching on PositionDial this month. PositionDial is about exploring where you stand, seeing views from all sides, and living your values. Brands are another type of ‘match’ you can now get in addition to your commentator, political party and politician matches. Making it really easy to join the dots between where you stand and how you live your life. Brand matching was presented at Bethnal Green Ventures demo day, after PositionDial completed its summer 2015 programme. You can read PositionDial’s profile on the BGV blog here – we will link to a video when available. What is a brand PositionDial? A brand’s PositionDial visually summarizes its activities, work practices and supply chain on matters ranging from animal welfare and workers’ conditions to environmental impact and use of chemicals. To build a brand PositionDial our team curates independent certifications, labels, awards and media investigations about a brand / product’s behaviour and actions and relates them to ‘positions’ – like ‘products for people should not be tested on animals’. For example we use sources like the Living Wage Foundation, Stonewall’s most LGBT-friendly workplaces, Carbon Disclosure Project, Oxfam Behind the Brands study, Davies Report on % of women on boards. Is ‘regulatory’ a better label (Position descriptor) than ‘authoritarian’ on PositionDial? We often have a slightly different understanding of different terms. But yet still certain words provoke responses. Differences of understanding, and positive or negative connotations. We have also been clear, that Position descriptors are up for questioning, debate, improvement when needed. Not least because, as the late great Ciborra said- in categories, and particularly – between categories – there is suffering (yes, in relation to information systems). So as we’ve had a few tweets on this particular axis / label lately. And it has been one I’ve wondered about previously, anyway, and have been surprised we haven’t had more feedback on. It seems well worth delving into at this juncture. (Not least as, with the general election fast approaching, avoiding discomfort to our users, political parties and indeed political candidates at this crucial time is high priority). @PositionDial @la_gaia @CurlingRiver would dispute that state control of industry is authoritarian. Regulatory perhaps. Bearing in mind, first of all, we never label a side as ‘good‘. But neither, do we want to label a side, or have a label that is seen to be, ‘bad‘. Is the alternative proposed (regulatory) better? 1 Does authoritarian mean control? First of all, semantically, historically, does the word authoritarian mean control? Are we using it correctly? 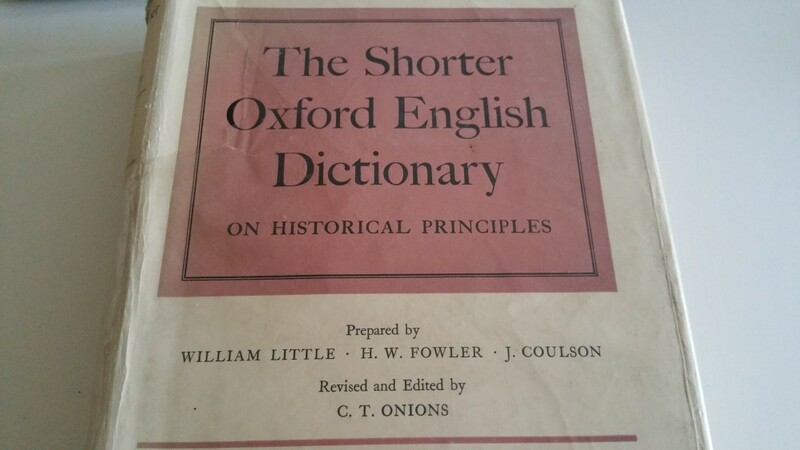 According to the “The Shorter Oxford English Dictionary on Historical Principles” (which my late Grandad once conveniently (kindly) gave to me – (unsolicited!) … (and don’t be fooled by the ‘Shorter’ – it’s in two massive chunky hardback tomes). So in answer to the first question. Authoritarian does mean control and regulation. It is correct and accurate, semantically, logically, to use authoritarian in the way we are using it on the PositionDial. Does the word authoritarian provoke offense? When labelled so? To some, yes. As shown above. Which is of course something we seek to avoid. It is important here, now, with this, and any other similar such problems with labels we might have in future, to consider very carefully. Even, especially, if only a minority are affected. Because to have all the different shades of grey of positions and views brought together and explored, genuinely, differing perspectives must not be excluded, irritated or offended wherever possible. 3 Is the alternative proposed (regulatory) better? The alternative proposed is ‘regulatory’. So instead of using authoritarian / libertarian as our axis. We would use regulatory / libertarian instead. (Keeping libertarian as, as yet, people understand it, and no one has yet been offended by it, and non-regulatory sounds more convoluted- we try to avoid double-barrels where possible). How do we define better? To explore this, it’s necessary to delve into whether it makes sense to describe all possible positions, in context, as regulatory instead of authoritarian. If we set financial or other penalties on industrial activity deemed environmentally harmful. It is controlling of behaviour by industry. We set financial or other penalties on drug related activity, eg the possession of drugs for personal use. It is controlling of behaviour by individuals. A broader civil liberties example – we believe as a society (or at least our government) that we should not speak “hateful speech.” To be specific (getting more fictional here for the sake of clarity, please bear with) … if you call me anything in the animal kingdom (dog, pig, rabbit) this is hate. The government sets financial or other penalties on calling each other animals. This is regulation / legislation. And finally, to give another example, which becomes more and more important in this online age – some believe that the government should not be monitoring us. The government monitors what we write, say, (think..? ;)) in order to protect us. When we are free. No one is watching or listening to us. When we are controlled. It is that there is regulation, determining we should be watched, and monitored. So that extremism can be identified before it harms our society or system. It is also regulatory (underpinned by government rules and powers to watch us). So for all applicable contexts explored here ‘regulatory’ does work as a label. Semantically. What about a Position on having more police on the streets? Can we use ‘regulatory’ then? Well, at a push. It doesn’t read as neat as authoritarian, but the police are there to enforce legislation and regulation after all, so it does sort of work. c) Is ‘regulatory’ just as understandable, if not more so? When someone uses PositionDial. Especially for the first time. Will they ‘get’ what regulatory means? Will seeing that word, as their ‘Position descriptor’ or label, be any less understandable than seeing the word authoritarian? Arguably, the word authoritarian is in more common use. It is used in political discourse more. It appears more commonly on political science tests and quizzes and cool stuff like the Political Compass. This regulatory vs authoritarian question reminds me of similar wranglings around the eco-friendly / eco- sceptic axis. Vs the more accurate in some cases – manmade vs natural axis. In case this isn’t obvious, this came about due to people (well, one of our trusted advisers) saying that eco-friendly vs eco-sceptic isn’t a fair label. That it doesn’t work for him. That he cares about the environment – about conservation for example, but just doesn’t believe in manmade climate change. So we started using manmade vs natural as an axis instead for the climate change topic. Is authoritarian to regulatory as big a leap? Is the understandability factor as problematic? Understandabilty is a very important factor. Because with PositionDial we seek to engage not just political animals, but the politically curious: those who are not sure where they stand, and even less sure where politicians, who want their vote, stand. So we must not make decisions / change Position descriptors based around semantic sensitivities at a highly intellectual level, at the expense of appealing to, and being used, and understood by, and empowering, those who are not yet as politically engaged and studied. Tell us your view: what works better. For you, and everyone? There can be no better judge than you, the crowd, on this. Do you understand regulatory as well as you understand authoritarian? Even as a label seen quickly / out of context? On a PositionDial? Here’s a qualitative poll (yup, it’s a thing, or it is now). Please comment below and on Twitter whether we should update authoritarian / libertarian to regulatory / libertarian. We’re listening. And will act accordingly. And keep this question open to feedback ad infinitum. Look forward to hearing from you.